Outdoor spinach on the Spring Equinox (with peas interplanted). 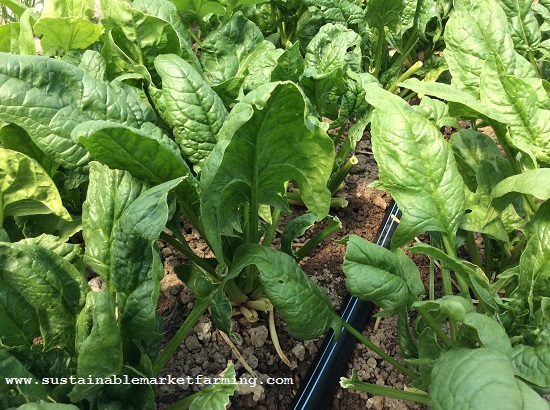 Unable to buy our long-time favorite spinach variety, Tyee, we have tried various other varieties. This winter and spring we compared Avon, Reflect, Acadia, Escalade, and Renegade, in the hoophouse and outdoors. We are looking for a dark-leaved savoy type, with good cold tolerance and good bolt-resistance once spring arrives. Sowing #1 9/7/17, all pulled up by 4/24/18, after a productive winter. In November and December, Renegade had the largest leaves, so its advantage in central Virginia hoophouses is probably as a faster-growing type. Reflect is growing bigger/faster than Avon. Renegade is faster/bigger but paler than Avon. Acadia has more leaves than Avon, Reflect, Renegade. Escalade is also faster and bigger than Avon, Reflect, Renegade. 4/10/18: The plants have not changed much in the last month, although in comparison with the February photo, you can see the leaves are starting to become pointed in shape. We are waiting to see which of the varieties bolts first. 4/24/18: Reflect, Avon, Acadia, Escalade, Renegade. All are now growing thinner pointy leaves and starting to bolt. Renegade has large leaves, but the color is paler than the others and the texture is less exciting to us. Acadia and Escalade both had thick, well-textured leaves. Pity I did not directly compare Reflect and Acadia! Hoophouse spinach variety trials in early April (note some cold damage). Left-Right Avon, Acadia, Escalade, Renegade. 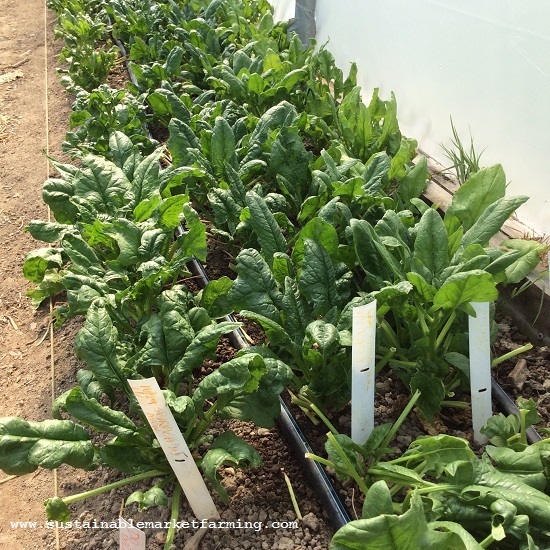 Hoophouse spinach variety trials in late April. L-R Avon, Acadia, Escalade, Renegade. 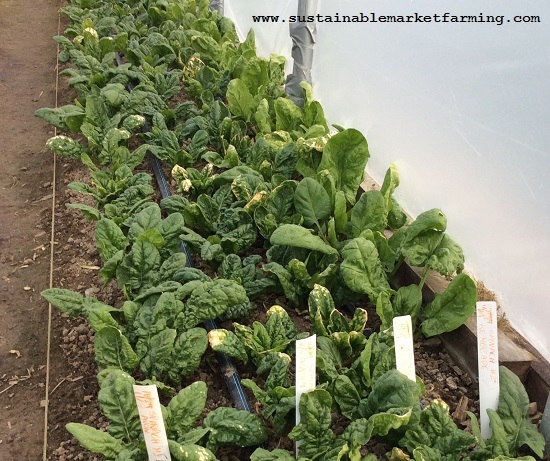 Hoophouse spinach variety trials. Comparing bolt-resistance. May 1. L-R Avon, Acadia, Escalade, Renegade. Sowing #4 1/15 (for transplanting inside the hoophouse). 4/25/18: South side Avon – pointy; North side Reflect – bigger than Avon, less texture, also pointy. Sowing #5 1/16 (for transplanting outdoors). 4/25/18: North side Reflect – a bit pointy, smaller than Avon and Acadia; South side Renegade, Escalade, Acadia. Acadia is bigger than Escalade, darker and more textured. We transplanted from #4 and some #5, mostly not labelled. All look good 4/25. Avon transplanted 3/14, looks great. Big textured leaves. Reflect transplanted 3/16 – also good. Acadia and Escalade win on early harvests (December and January). The smoother-leaved Renegade definitely has thinner leaves 4/10, and would yield lower weight (if we were weighing them). Acadia wins on bolt-resistance in the hoophouse on 5/1. Escalade is not far behind. Reflect wins on 4/25 over Avon in the 4th hoophouse planting. Acadia wins on 4/25 in this 5th hoophouse planting. No clear better variety between Reflect and Avon in the late hoophouse transplanting from the 4th and 5th plantings. 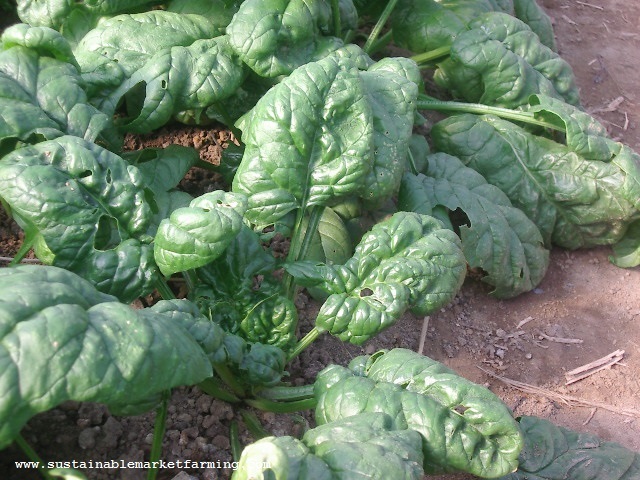 We don’t like smooth-leaved spinach as much, so will maybe drop Renegade – it doesn’t shine on anything else except being earliest, but then becomes less productive. Acadia did very well, Escalade not far behind. Perhaps drop Avon for hoophouse too. Perhaps continue Reflect, Acadia and Escalade, and do comparisons of the 3 only. Or just grow Acadia in the hoophouse. 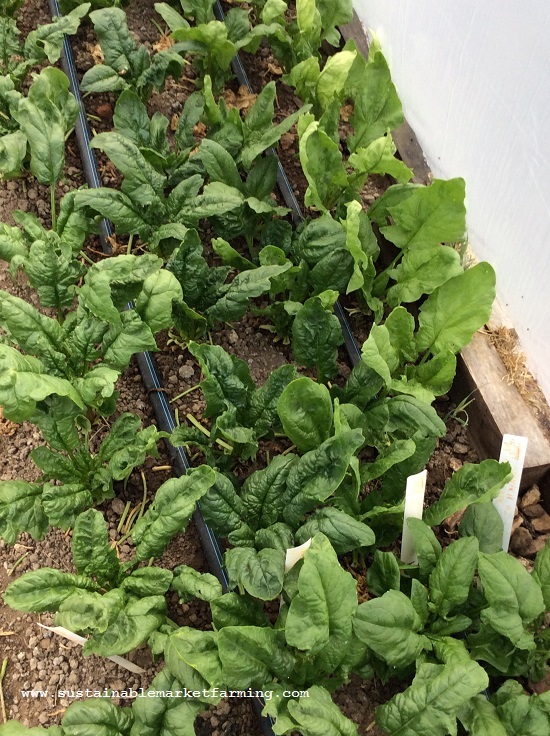 Hoophouse spinach variety trial on May 1. Top: bolting Renegade; bottom: Escalade. 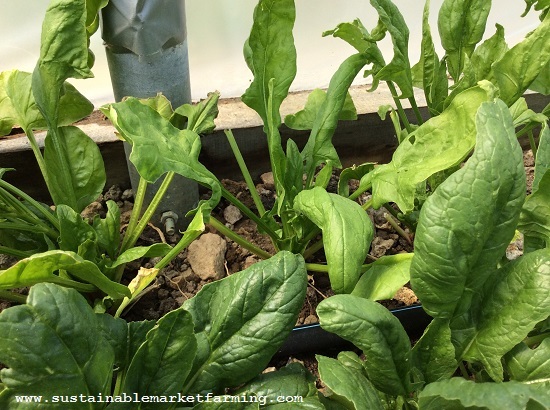 Hoophouse spinach variety trial on May 1. Left of driptape: Acadia, right: Avon (see arrowhead leaves). Reflect spinach in the snow in January. Outdoors we had overwintered Avon and Reflect. Both did well. 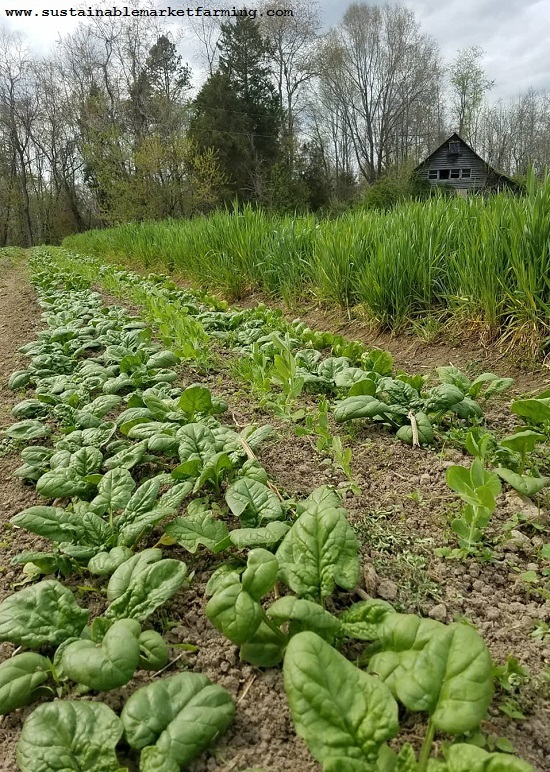 2018 conclusions for outdoor over-winter spinach plantings: Grow Avon or Reflect. Both did equally well. For simplicity, maybe drop Avon. 3/21/18: Reflect looked really good. Acadia, Escalade, Renegade not so good. Bed 15W all Avon looks good. Good size, good color. Bed 16W has 3 rows Avon, 1 row Renegade (north). Renegade is smaller and lighter color – a more yellowish cast. Bed 20W mostly Reflect, doesn’t look that good, partly because of lots of weeds. Avon the same. Bed 23W 2 rows Reflect (south), 1 row Acadia, 1 row Escalade (north). Escalade is smaller 4/26. Bed 15W all Avon Good size, but all yellow, especially south edge. May have drowned. Only slightly pointy. Bed 20W all Reflect, less yellow than Avon in the other beds. Bed 23W 2 rows Reflect (south), 1 row Acadia, 1 row Escalade (north). Reflect is really good where not drowned, if a little pointy. Acadia is even better than Reflect, also a bit pointy. Escalade is still smaller than Reflect and Acadia, also less pointed. Both Acadia and Escalade are a darker color than Reflect. Reflect wins over Acadia, Escalade on 3/21 and 4/26. Reflect wins over Avon on 5/2. Reflect and Acadia win over Escalade for current productivity on 5/2. Of the two, Acadia has better color. Escalade may win later as more bolt-resistant. We don’t like smooth-leaved spinach as much, so maybe we’ll drop Renegade. Reflect and Acadia did well for spring outdoor plantings. Maybe drop Avon. Maybe grow mostly Reflect and some Acadia for May harvests? Escalade may be more bolt-resistant, and warrant growing one bed of four. If not, drop Escalade for spring outdoor planting? 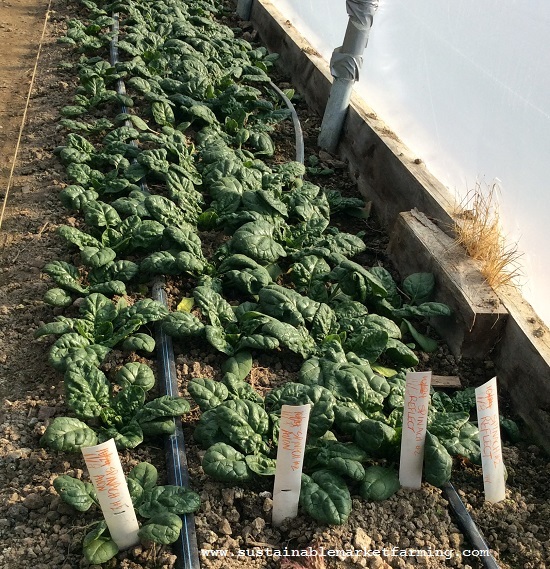 Feb 21, 2017 : Spinach overwintered in a coldframe; Transplanting the last Tyee, alongside Reflect and Avon this spring. February 6, 2018: Spinach Variety Trials (Tyee, Chevelle, Avon, Reflect, Renegade, Escalade and Acadia) and Planting Plan. Details of the varieties. We have trouble getting any spinach to germinate by seed. 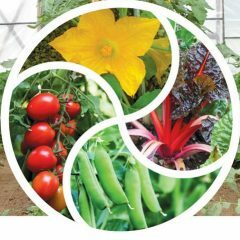 We have both outside and hoop house (20 X 30 feet). What Ph does spinach require? I liked your hoophouse trials of different varieties. We are planning to attend Heritage Festival at Monticello this year for the first time. We live in Bucks county PA..
I’ll be speaking at the Heritage Harvest Festival in September (see my Events page), and cruising around the booths to see what’s happening. Hope to run into you. Spinach germination – it’s really poor if too warm. 86F (30C) is the maximum soil temperature. 59F-86F (15C-30C) are the best temperatures for fast emergence, but that’s only part of the story! At 59F (15C) 82% of the emerging seedlings will be normal. But if it’s warmer than that, it’s not so good. At 68F (20C), only 52% of the seedlings will be normal, and at 77F (25C) a mere 28%!. So cool soil is very important. Have you tried pre-sprouting? Soak the seed overnight, drain off the water, lay the jar on its side in the fridge. If you remember, roll the jar once a day. After a week, sow the sprouted seeds by hand (gently). This is what we do in early September, when the soil is too hot. In the fall watch for dead nettle, chickweed and henbit germinating, before putting dry seed directly in the ground. I have a post about it -try the search feature. I can’t write comments and search at the same time, or I’d put in the link. pH, well, 6.0-7.0. I doubt that’s the problem in Bucks County, PA.